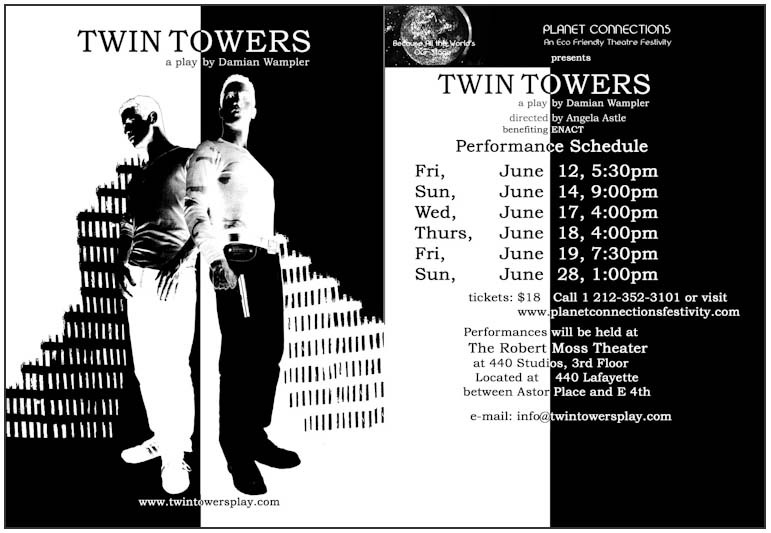 The world premiere of Damian Wampler’s soulful play Twin Towers will be presented as part of The Planet Connections Theater Festivity from June 12 through 28, 2009 at the Robert Moss Theater at 440 Studios (440 Lafayette). Proceeds from the play will benefit the non-profit organization ENACT, where actors use role-play and drama therapy techniques to help New York City students learn emotional and social skills. Set in the Bronx during the recent Bush Era, Twin Towers explores the struggle between natural law and positive law - what we know in our hearts to be right versus what society and our government tell us. The play focuses on the lives of two African American childhood best friends – Trevor and Jamal, the Twin Towers of the title -- who have chosen very different life paths. Trevor has returned from Iraq as a war hero while Jamal has returned from years overseas as a member of the Peace Corps. The two clash as the fantasy of their childhood innocence fades to reveal the truth of each man’s character. Twin Towers is a coming of age story not only for two young men but for our country as well, critiquing the moral vacuum we experienced during the last eight years. Incorporating music, dance, a Brazilian dance-like martial art called Capoeira and dialogue overheard on the streets of New York City, Twin Towers presents an urgent plea for self investigation and transformation. Directed by Angela Astle (Adam Szymkowicz’s Pretty Theft), Twin Towers includes a cast that features Kena Anae, Jason Hurt, Patricia Gibson, Myla Flores, Quatis Tarkington and Lauren Kelston. The play benefits the New York based non-profit ENACT, which uses professional teaching artists to inspire and education urban youth using drama therapy techniques. “ENACT really embodies what the play Twin Towers is all about,” says Suzanne Lee, the play’s liaison at ENACT and a returned Peace Corps volunteer herself. “ENACT shows that everyone has the power to make change in the world, as long as they recognize that the skills they have are valuable.” Audience members may make a donation at any show to support ENACT. For more information about ENACT, visit www.enact.org. Performances of Twin Towers are Friday, June 12th at 5:30 pm; Sunday, June 14th at 9:00 pm, Wednesday, June 17th at 4:00 pm; Thursday, June 18th at 4:00 pm; Friday, June 19th at 7:30pm and Sunday, June 28th at 1:00 pm at the Robert Moss Theater at 440 Studios (440 Lafayette, 3rd Floor, Subway 6 to Astor Place or N/R to 8th). Tickets are $18 at www.planetconnectionsfestivity.com or (212) 352-3101. There will be a reception to meet the author and cast of Twin Towers on June 12th at 7:00pm in the lounge of 440 Studios, directly following the world premiere. For more information, visit www.twintowersplay.com. Damian Wampler (Writer, Producer) graduated from Boston University with a bachelor’s degree in English and Anthropology in 1999 and two weeks later boarded a plane bound for Kyrgyzstan. He served as a Peace Corps volunteer in the Kyrgyz Republic from 1999-2001 teaching English. He earned a Master’s degree from the University of Wisconsin-Madison in Russian, Eastern Europe and Central Asian Studies with a concentration in Human and Political Geography. He was a Fulbright researcher in the Kyrgyz republic from 2005-2006. In 2006 he moved to New York City to recruit for the Peace Corps. 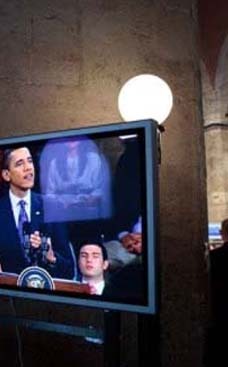 He is currently a professional photographer and full time graduate student of the School of Visual Arts earning a Master’s degree in digital photography. He was recently part of a group exhibition called Face Time, where he showcased intimate portraits of New York City’s homeless. He is a volunteer photographer for the Red Cross of Greater New York and for Heartgallery NYC. Angela Astle (Director) moved from Denver, Colorado, to New York in August as a Venue Director for Fringe 2007. She made her New York directorial debut Spring 2008 with Retro Productions’ Mill Fire (nominated for five NYITA awards). This Spring, Angela was the Director of Flux Theatre Ensemble's critically acclaimed Pretty Theft, written by Adam Szymkowicz. She has directed numerous short plays at Manhattan Theatre Source including, Waffles by Martha Garvey for the Estrogenius Festival and A Place For Owls by FIona Jones. She is currently Associate Producer for New Perspectives Theatre Company, and is developing and directing two other new plays which will debut Summer 2009. Planet Connections Theatre Festivity is committed to producing high-quality theatre, with non-traditional casting, unique perspectives, political theatre and more! All of the productions are curated and created with the hope of inspiring cultural education and human understanding.